The holiday season is here and that means holiday PARTY season. Swoo Rule #1: Never show up empty handed. And by “not showing up empty handed” – we’re not saying you need to spend a ton of money on the gift – we just believe it’s a thoughtful gesture to give the host a little something to say thank you. There are so many creative and personal ways to say thank you – without breaking the bank. Here are 10 of our favorite ways to say thank you this holiday season. 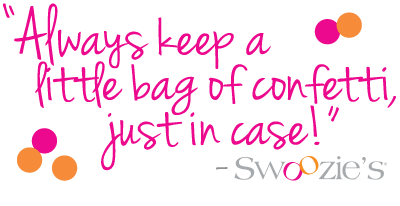 Another tip: keep some go-to hostess gifts “on hand” for those impromptu occasions. We love fun tea towels or cocktail napkins that can double as fun conversation starters! This classic cutting board is not only stylish, but will definitely be put to good use. The initial gives it that personal touch. Pair it with their favorite cheese and crackers, so they can serve at the party! Whether you gift one, two or four, this gift is perfect to pair with a nice bottle of wine, fun cocktail napkins or bottle topper. It’s an exclusive gift they will rave over! Treat the hostess with the mostess with fun Southern-inspired accessories! We love these coasters by Draper James, Reese Witherspoon’s lifestyle brand. Raise her spirits with wine in a fun designer wine bag. Easy to store - these bags are great to keep on hand for those last-minute invites. Pair with their favorite wine, and it makes a perfect gift! Landmark towels are great to celebrate places you are, places you’ve been and all the memories shared! Available in multiple states and cities to make it perfect for them! Perfect for the hostess who loves to cook! Pair with your favorite recipe and maybe she’ll even make it for you! Add a recipe that they can try out! Perfect for indoor or outdoor use - this growing kit is the gift that keeps on giving! Available in 3 different sizes, this gift allows you to give a custom gift without the hefty price tag. Perfect for all your holiday events! Impeccably blended with a high dose of Southern charm, this soap set comes in such beautiful packaging, you don’t even need to wrap! This shatterproof drinkware is one of our go-to gifts for every occasion! Add exclusive personalization to make your hostess feel special. What’s your favorite hostess gift idea?